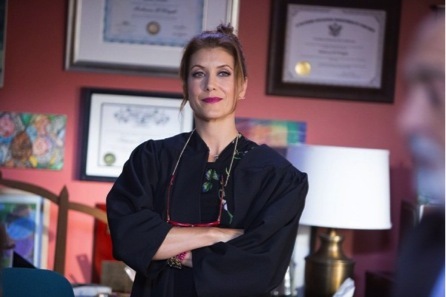 This episode of “Bad Judge” was a little different from the previous two. No Gary, no Robby Shoemaker, and also no crazy Rebecca antics. Sure, Rebecca is Rebecca, and she spends the majority of this episode avoiding confrontation and ruling her courtroom with a combination of sarcasm and wry wit, but she has mellowed out significantly. She didn’t flip off a reporter or slam an axe into the tire of some guy who honked at her in traffic. I don’t think she even had a single drink! Are you okay, Rebecca? I’m concerned. The episode starts with Billy, the hunky firefighter, showing Rebecca some new self-defense moves, followed by an invitation to The Fireman’s Ball. Luckily Rebecca now knows how to defend herself in uncomfortable situations, and she uses one of her new moves on Billy, knocking him out before she has to give him an answer. In court, Rebecca is presiding over a sexual battery case. The defendant, Chad Forbes, owns a restaurant called BJ Knockers. Although the prosecution has a star witness with a roommate who kept a “very detailed diary,” Chad is paying her not to talk. Chad also has a super hot lawyer (Angelique Cabral) to help persuade all the men on the jury into voting her way. Rebecca can’t remember the court stenographer’s name, and Tedward won’t tell her. This is one more thing we can add to the growing list of situations Rebecca is avoiding. The other item on that list: Billy the firefighter. He’s texting, he’s calling, he’s showing up at the courthouse, and Rebecca is avoiding him like a ninja in high heels. The third item on this list of avoidance is the tragic death of her van, which was hit and caught on fire in the previous episode. The next day in court, Rebecca asks the stenographer her name (it’s Judy, “the same first three letters as Judge”) which is progress for Rebecca, and we finally meet handsome, slimy, Chad Forbes. Billy, who was choked until he lost consciousness the last time he saw Rebecca, can’t remember if he had invited her to the Firemen’s Ball yet or not. Judy, stuck in the elevator with them for this conversation, kindly offers to stand in the corner and sing a Drake song to herself, but Rebecca, still avoiding confrontation, clings to Judy’s presence like a shield. She told Billy that she was waiting to answer because Tedward has her calendar, but when Billy offers to accompany her to her office, she tells him that she’s actually going car shopping. He offers to go with her again, and this time Rebecca accepts. However, when Billy continues to bring up the Fireman’s Ball, Rebecca drives off the lot in her new car without him. Well, at least she can cross dealing with the death of her van off her list! Back in court, the defense motions to get the diary removed from evidence, as without the sworn testimony of the owner herself, it is nothing more than heresy. Rebecca denies the motion, but in anticipation of this ruling, the defense had already filed an interlocutory appeal. This means that Judge Hernandez will have the final ruling on whether or not the diary will count as evidence. Hernandez rules in favor of the defendant, and Forbes gets to go free.